We are so honored to have been able to have a buck of Zorro's caliber in our barn! His dam, Dulce De Leche is an elegant doe with a wide, strongly attached mammary, long flowing neck, and strong front end! 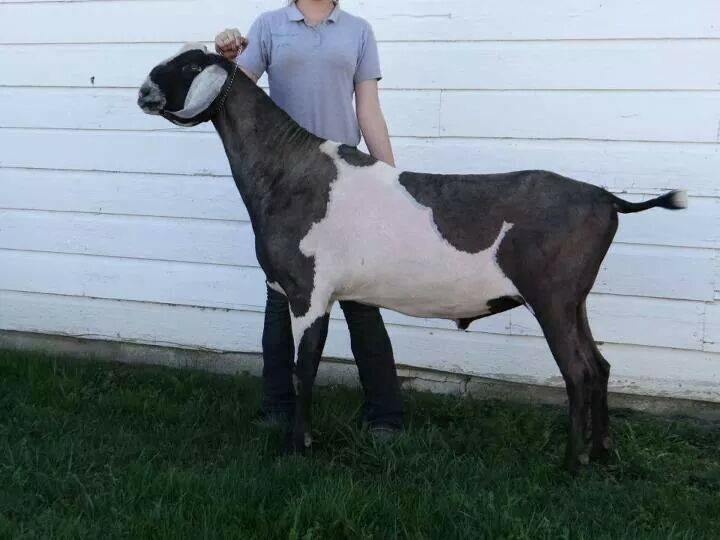 She is the daughter of the famous spotlight sale buck Lynnhaven Prince of Paradise. Prince's dam, Paradise is an exceptional doe, being crowned the 2003 National Grand Champion. I have had the opportunity to work with Paradise, myself, and was very impressed by her quality! The sire's side is far from average! Timeless is a HUGE, and beautiful buck. Lynn doesn't usually show bucks, but had to take him out, and finished him the first day, going GCH in all four rings at the buck show. His sire, is the son of Temerity, a 93EEEE doe, who was 08 & 09 National Grand Champion, as well as being All American in 07, 08, 09, & 2010! Timeless' Dam, Moulin Rouge did not have an impressive list of accolades due to bad mastitis damage, but she has produced some impressive offspring, including Timeless' littermate Baton Rouge 91 EEEE, and has proven herself through them. Zorro himself is very big, long, and wide! We have high hopes for him, and the genetic potential he has to add to our herd! So far, in Zorro's junior kids, we have seen incredible width, style and strength of general appearance. We are very excitedly waiting to see does in milk! Thank you to Lynn Fleming for entrusting us with this fine buck! Zorro recently was tested for G6S and is Normal. After using him on some does this year, we decided to let Zorro go to a new home being he is so related to almost our entire herd. we LOVE what he has done for us, and are excited for him to have the opportunity to work in another herd as well.